Is three day battery life truly possible? Update: The Lenovo P2 is now no longer ranged by Three in the UK. It means none of the major UK networks are selling the device and it's quite hard to come across the handset SIM-free. This review was written when the price of the phone was £199, but now prices for the P2 have been seen as high as £370. If you're after a phone with similar features to the Lenovo P2, be sure to check out the Moto E4 Plus that also sports a huge battery or read our best cheap phone guide too. 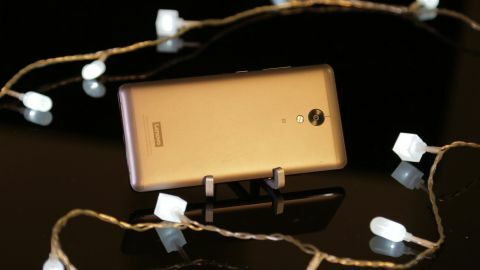 Short battery life is still one of the biggest complaints people have about their phones in 2017, but Lenovo may have just solved that problem with its latest cheap handset. The company claims the Lenovo P2 will last you three days and not skimp on other areas to be able to do it. Many companies claim to have phenomenal battery life on their phones, but don't always make good on that claim. Yet the Lenovo P2 really does last a long time, and it's a great phone in a lot of other ways too. So should this be your next budget buy, or does it have hidden faults? Only out in the UK but no longer ranged by any of the major networks. The Lenovo P2 may have mid-range specs on paper, but it launched with a fairly low-end price. In the UK it originally cost £199 (about $250, AU$330) putting it in the same price bracket as the Moto G4 Plus and a little bit more than the Moto G5. It was initially a Three exclusive device in the UK, but now the network has dropped the Lenovo P2 in favor of ranging the Moto E4 Plus. That now means none of the major networks are ranging the Lenovo P2. The only way we can now find to buy a new Lenovo P2 in the UK is through Amazon where it costs almost double its original price. It's a real shame, but the Lenovo P2 isn't worth £350 when it originally launched for less than £200. Lenovo hasn't revealed any plans for a release in Australia or US and considering the P2 has been out in the UK for sometime we don't expect it to launch in those other markets at all. If Lenovo does decide to launch the P2 in either the US or Australia, we will update this review with the full details. Most phones with a similar price to the Lenovo P2 don’t have a full metal unibody, and especially not one that feels as premium as this phone. Other people who see you using the P2 won’t be able to tell it’s a budget device, but it's got more than just good looks, as it feels quality too, and there are rounded corners that mean it doesn’t feel sharp on the palm of your hand. The design is very reminiscent of the Huawei Mate 9, but it's a little bit smaller. It’s still large though – those with smaller hands may struggle to reach some parts of the phone. If you’re used to a larger phone you’ll find this easy to grip, but those who generally use smaller devices may struggle. Considering the size of the battery in the Lenovo P2, the company has managed to keep the device surprisingly slim. The iPhone 7 is considered thin at 7.1mm and we’ve seen even thinner devices than that, but at 8.3mm thick the Lenovo P2 is far from fat, and it’s worth sacrificing a slightly slimmer design for the added battery life on offer here. It's worth noting how heavy the P2 is though - it feels weighty in the hand and at 177g, it's on the heavier end of the spectrum. For example, the Moto G4 Plus doesn't have a metal design or a large battery so only weighs 155g. There’s a home button below the screen, with a built-in fingerprint scanner. It works quickly and is in a good place to tap when waking the phone. A fingerprint scanner this good is another feature you won't always get at this price point. The volume rocker and power button are on the right edge, and are easy to reach when you have the phone in your hand. On the left edge there's a flick switch, similar to the silent toggle on an iPhone, which activates a power saver mode. It’s a useful feature if you often want to save on battery life. It’s in an awkward place though, as we regularly found ourselves clicking it by mistake when taking the P2 out of our pocket. This can get irritating, especially as it turns off some connectivity options such as Bluetooth and disconnects any other devices you have connected to the P2. This is a minor gripe with the Lenovo P2’s design though and everything else is generally in a good place and feels more premium than the phone’s price suggests. The front of the Lenovo P2 features a bright 5.5-inch Full HD AMOLED display. It comes in at 401 pixels-per-inch, which again, is good for the price. You can still buy 720p phones with large screens for £199 (about $250, AU$330) so this is a strong setup. The P2's display is also bright, has a good color range and you won’t be disappointed when watching video on it. Viewing angles on the P2 are good as well. The large size of the display may be a problem for some, but we liked it as it offered a large picture when watching movies or playing games.